Thirsty Thursdays: A Beer Review. Bet I can guess what you are thinking- these guys are going to start writing beer reviews so that they can drink them. You know what? You’re right! With the recent surge of craft beer and microbreweries across North America we want to share with you our passion and personal opinion on the many beers out there. The weekly review will encourage you to get out of your comfort zone and try something new. 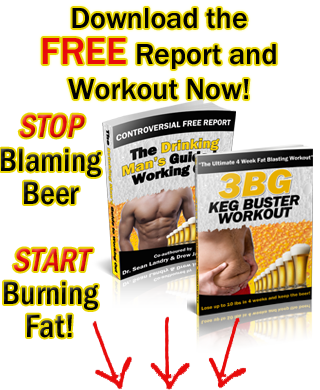 Hopefully you’ll be more adventurous when it comes to making beer choices. The “winos” can’t have all the fun. Last night Sean and I hit up a local restaurant walking distance from his apartment. The resto of choice was made thanks to Sean’s Entertainment book which gave us $16 off the bill (highly recommend grabbing one of these booklets if you don’t have it already). Before sitting down we were scoping out what beers they had on tap. As the waitress guided us through the list of the usual Canadian suspects she finished with the special of the night- “Keith’s Ambrosia Blonde”. It was a very reasonable $4.50 for a pint of beer. A steal of a deal in terms of Vancouver’s inflated beer prices. We had to give it a try. 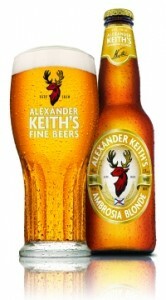 Keith’s Ambrosia Blonde is brewed by Alexander Keith’s. The brewery was founded in Halifax, Nova Scotia in 1820. It has been producing beer in Canada for over two centuries and only recently made the jump across the border into the United States. Operated by Labatt, a subsidiary of Anheuser Busch-Inbev, Keith’s brand is produced throughout Canada. It is best known for it’s India Pale Ale but also has dark, light, amber and premium white varieties. The Keith’s Ambrosia Blonde is one of the their seasonal brews. The brew-master refers to the beer as a deep gold and medium body brew which delivers captivating aroma, a distinct flavorful taste, slightly hoppy and hint of caramel, aged longer for a crisp finish that is perfect for warmer days. The Ambrosia Blonde taps out at 5.2% alcohol by vol. Our initial reaction of this all malt brew was that it was much darker than your typical blonde. The beer had a full head which tried to hang around for a little while but eventually ran out of steam and faded away. There was no visible carbonation, but as Sean postulated, it might have been because they were serving us the bottom of the keg and the very reason behind the beer being on special. As I stared at Sean’s ugly mug through the pint I noted the clarity and golden color with a slight reddish tinge, which can most likely be attributed to the hint of caramel. The Ambrosia attempted to keep a microbrew feel and taste. I was reminded of the Scottish beer Tennant’s I used to drink while playing hockey over there, which wouldn’t be too far off as the company’s roots come from Scotland. Keeping with the Keith’s novelty the Ambrosia Blonde offered a hint of hops without any bitterness. It was a crisp and dry finish. As a rookie beer connoisseur this beer was tasty but easily forgotten. If you have access to this brew-masters special in your home town, don’t just take my word for it- give it a try and see for yourself.